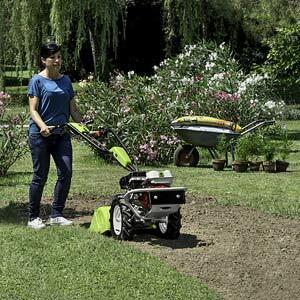 Grillo G 46 is an innovative walking tractor, ideal in horticulture and gardening. 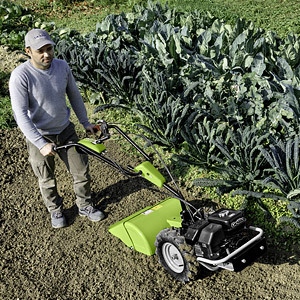 Thanks to its compact dimensions, it works easily in narrow spaces. G 46 is perfectly balanced, fitted with an oil-bath gearbox with one forward gear and one reverse gear. A very comfortable lever is used to shift from the forward to the reverse gear. 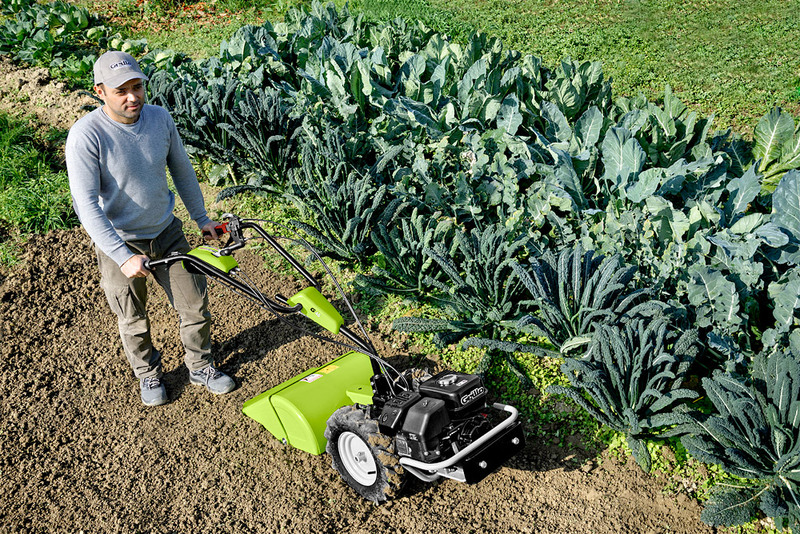 In spite of its reduced weight and dimensions, the contra-rotating tiller grinds even the hardest soil. 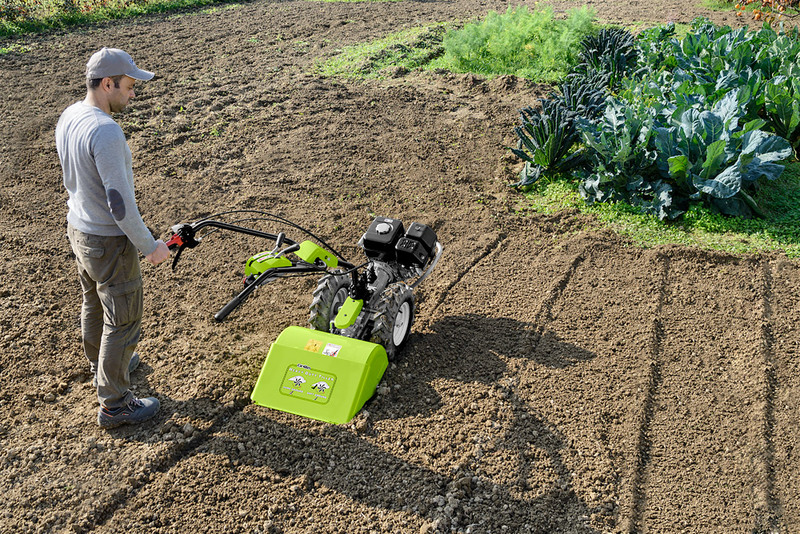 One hand is enough to till with the G46, the contra-rotating tiller allows the walking tractor to perfectly adhere to the ground. 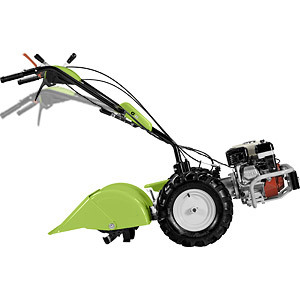 The width of the tiller is 50 cm and its tempered steel tines have a diameter of 26 cm. Tilling depth can be changed into 5 different positions by adjusting the rear skid. 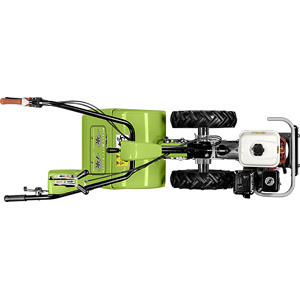 This skid is particularly useful for works on sandy and soft soils, because it prevents the tiller from sinking excessively into the ground. 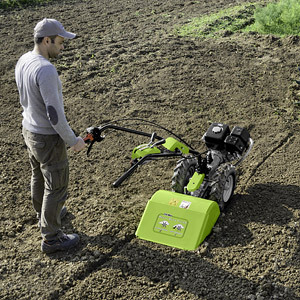 There is no need to push down hard on the handlebar, just allow the walking tractor to move forwards. 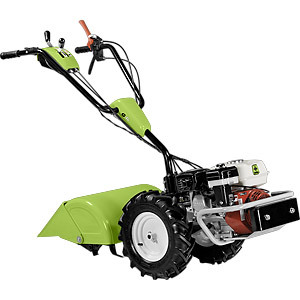 As all Grillo machines, the G46 was designed to ensure total safety while working. 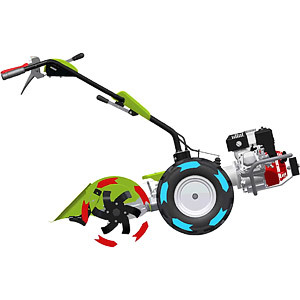 G 46 comes with the Honda GX200 petrol engine, that is fitted with a robust engine guard. Forward gear and PTO are engaged independently from each other. G46 is equipped with an active coupling, ensuring therefore maximum safety and handiness. When the lever is released the wheels stop immediately whilst the engine keeps on running. The Grillo active clutch guarantees perfect safety work. The height-adjustable handlebar adapts to each operator and to any ground depth. 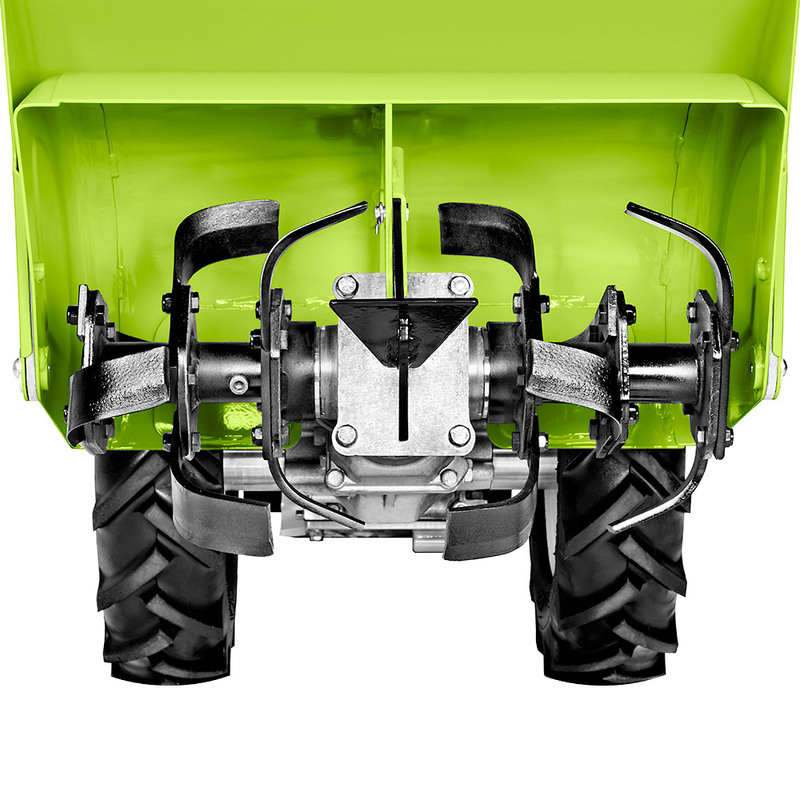 The side positions of the handlebar of the G46 prevent re-entering on the tilled ground, leaving it therefore so even. 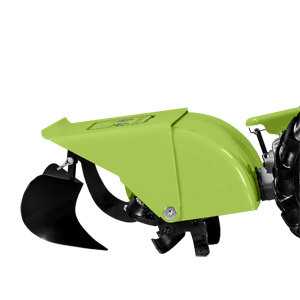 The furrower can be mounted behind the rotary tiller to obtain irrigation or seeding furrows. 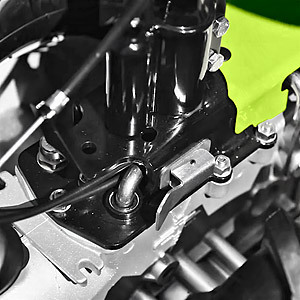 G 46 is equipped with a lever that disconnects the wheels from the gearbox, making therefore transfers easier when the engine is off. The oil-bath gear box manufactured at Grillo’s premises was designed to grant a high lifespan. Cleaning and maintenance are extremely simple! Check periodically the engine oil level and clean the air filter. Painting of Grillo machines incorporates a double electrostatic powder coating process. At the first stage are the washing baths and preparation, then a first protective coat is applied which is then baked in a special oven, this has proven to be the best base for the application of the finish. The second coat consists of powder coating and still further baking in an oven at 190°C, this then produces the characteristic hardness and shine. 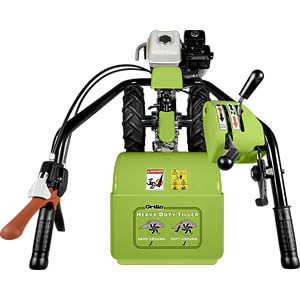 All machines are assembled with care in every detail and tested scrupulously by specialized personnel. Final inspection includes running the engine in order to check all its functions to ensure a further and final guarantee of a first class product. 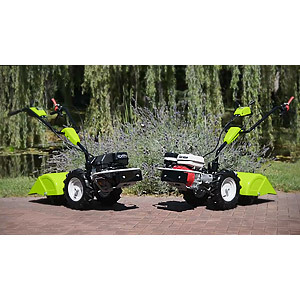 All Grillo machines are distributed and serviced by a widespread dealer network. Spare parts remain available for many years after production has stopped giving you extra confidence in Grillo. Standard rotary tiller Tiller with contra-rotating tines. Working width 50 cm.